Granny Prix Scratch Card Review - Casino Answers! 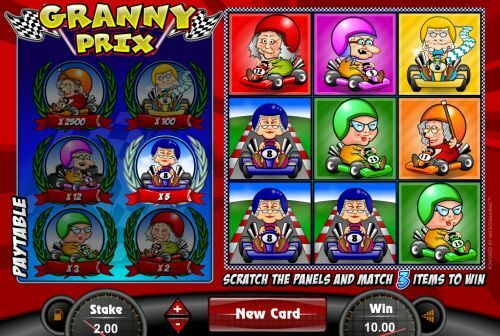 Granny Prix is an instant win scratch card game developed by Microgaming. You can play the Granny Prix online scratch card at Bovada. Bets on the Granny Prix slot machine are $0.50, $1, $2, $3, $4, $5, $6, $7, $8, $9 and $10 per scratch ticket. To start a new game, simply press the “New Card” button. To play, you can either click on each square yourself or you can press the “Reveal All” button to automatically scratch the entire card quickly and with ease. To win on the Granny Prix scratch ticket, you must match 3 of any symbol to win the prize listed on the paytable to the left. The highest paying symbol on the Granny Prix scratchie is the Orange Granny symbol. If you match 3 Orange Granny symbols, you will win 2500X your bet. The second highest paying symbol is the Yellow Granny, which can pay 100X your bet. You can win up to $25,000 playing the Granny Prix scratch-it lottery game at Bovada! There are 6 winning combinations on the Granny Prix scratch and win game. The complete payout schedule is as follows (payouts in parenthesis): Red Granny (2), Green Granny (3), Blue Granny (5), Pink Granny (12), Yellow Granny (100) and Orange Granny (2500). To win the corresponding prize, match three of that symbol on the Granny Prix scratch card. If you’re looking for some light, simple and goofy fun on your scratch card, there is no better option than the Granny Prix scratch card! It’s very colourful, easy to play and to understand and has a decent betting range to go along with it. You can play the Granny Prix flash game at Microgaming flash casinos like Bovada! Can USA players play the Granny Prix scratch-off lottery game for real money? No, American players cannot play the Granny Prix scratch card game for real money at this time. For an alternative, we recommend the USA-friendly Rival scratch cards at Bovada. Do I need to download any software to play the Granny Prix scratch lottery game? No, Granny Prix is currently only available at Microgaming instant play casinos including Bovada. You can play for free or real money. If you have any issues with the flash casino, download the latest edition of Adobe Flash Player today. If you want to read more reviews of other scratcher instant win games, please visit our Scratch Cards section for much more!